We are pleased to introduce firewall support for Azure Analysis Services. By using the new firewall feature, customers can lock down their Azure Analysis Services (Azure AS) servers to accept network traffic only from desired sources. 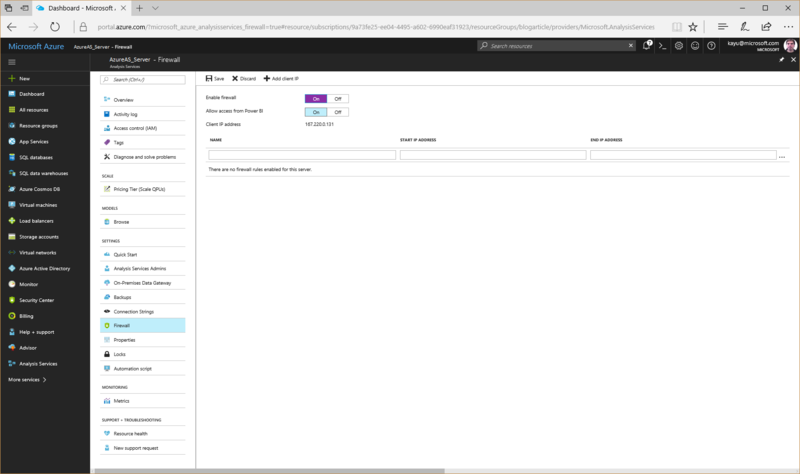 Firewall settings are available in the Azure Portal in the Azure AS server properties. A preconfigured rule called “Allow access from Power BI” is enabled by default so that customers can continue to use their Power BI dashboards and reports without friction. Permission from an Analysis Services admin is required to enable and configure the firewall feature. Any client computers can be granted access by adding a list of IPv4 addresses and an IPv4 address range to the firewall settings. It is also possible to configure the firewall programmatically by using a Resource Manager template along with Azure PowerShell, Azure Command Line Interface (CLI), Azure portal, or the Resource Manager REST API. Forthcoming articles on the Microsoft Azure blog will provide detailed information on how to configure the Azure Analysis Services firewall. Submit your own ideas for features on our feedback forum and learn more about Azure Analysis Services.